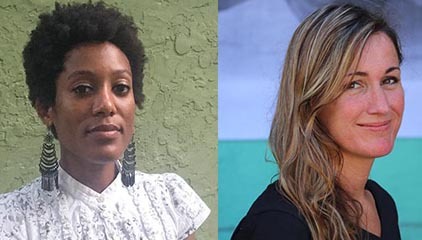 SAINT AUGUSTINE – The Crisp-Ellert Art Museum’s Artist-in-Residence Jamilah Sabur, Tuesday, Oct. 17, will discuss with Flagler College’s Anthropology Professor Dr. Lori Lee the intricacies of racial inequality, memory and migration, through the relationship of Sabur’s artwork and Lee’s historical, archaeological research. The conversation will take place in the college’s Flagler Room at 7 p.m.
An overarching concern within Sabur’s work has been how bodies negotiate their way in space, both in interior spaces and exterior spaces. This theme, and how it relates to relevant social, economic, and environmental justice issues, crops up repeatedly in Sabur’s sculpture, performance and video works. Sabur is an artist working across various disciplines including performance, video, and installation. Sabur was born in Saint Andrew, Jamaica and received her MFA in Visual Arts from University of California San Diego in 2014 and her BFA from Maryland Institute College of Art in Interdisciplinary Sculpture in 2009. She is interested in embodied cognition, social mimicry, dissonance, ritual and the uncanny. Recent exhibition and screening venues include Dimensions Variable, Miami, Fla.; History Miami; Los Angeles Film Forum; (S8) Mostra de Cinema Periférico, A Coruña,Galicia, Spain; Busan Corner Theater, Busan, South Korea. Sabur lives and works in Miami, Fla.
Lee is an Assistant Professor of Anthropology at Flagler College. She received her bachelor’s and master’s degrees in Anthropology from the University of Texas at Arlington, and her doctorate from Syracuse University. Lee is an historical archaeologist specializing in African Diaspora archaeology. She has been involved in African diaspora archaeology since 1997. Lee has authored articles on slavery in central Virginia and the Caribbean. Her research interests include race, health practices, the materiality of memory and migration. The CEAM Artist Residency, in collaboration with Flagler College’s Department of Art & Design, is a regular program of artists-in-residence to engage in themes of place-making while collaborating with some aspect of St Augustine’s local community, the city’s significant and varied roles in American history, or its rich natural environment. A goal of the residency is to foster diverse perspectives on these aspects of our local community, and artists and scholars in a range of fields are invited who integrate and collaborate between the areas of fine art and broader fields of inquiry, such as curatorial practice, performing arts and creative writing. Flagler’s Flagler Room is located in the college’s Ponce Hall, located at 74 King St. For further information on the exhibition and related programs, please visit the website at http://www.flagler.edu/crispellert, or contact Julie Dickover at 904-826-8530 orcrispellert@flagler.edu. The museum’s hours are Monday through Friday, 10 a.m. to 4 p.m., and Saturday, 12 p.m. to 4 p.m.